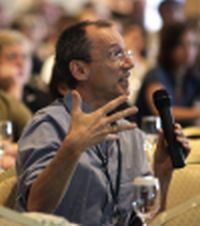 On Friday 6 August 2004, a group of participants at the 8th International Conference of Music Perception and Cognition at Northwestern University, Evanston (Chicago), Illinois, USA discussed the implications of doing research in the current international political context. The session belonged to the conference's social or extra-curricular program and was not refereed. seek to promote these views throughout the international community. My role in this meeting is to act as chairperson, but as an introduction let me briefly give an outline of what the four of us (Scott Lipsomb, Richard Parncutt, John Sloboda and myself) intended in organising the session. Following the attacks of 9/11, and in the run up to the subsequent war on Iraq, the four of us were active - to varying degrees and in different ways - in opposing the policies being pursued by the Bush and Blair governments. With the ICMPC8 meeting on the horizon, we agreed that it would be wrong, and at the very least a missed opportunity, to participate in such a large international meeting of our own closest academic community without explicitly recognising the international situation in which we do our research and trying to make some active contribution to the widespread opposition to transatlantic international policies. We agreed that in making presentations at the ICMPC8 it would be appropriate to have statements from individuals working in the UK, the US and mainland Europe, given the different perspectives emanating from these three geographical regions in the run-up to the war on Iraq - though these are of course only a tiny subset of the diversity of world opinion. John Sloboda, Scott Lipscomb and Richard Parncutt will therefore present three brief statements which, while clearly not claiming to ‘represent’ those geographical regions nonetheless come from the direct experience of working in three different environments. My own view is that by virtue of the particular skills and education that they are required to develop, academics should be well-placed to offer a critical and analytical perspective on the international situation within which they work. Academics can find themselves in positions where they have the opportunity to influence the opinions and judgements of nationally and internationally significant individuals and organisations; and academics are required to develop skills of communication and understanding, and of carefully considered analysis, which may play an important part in interpreting a complex and increasingly media-manipulated international situation. The function of this session, therefore, is first to try to arrive at a consensus statement on the international situation; and second to explore ways in which we can take that view beyond the relatively narrow confines of this meeting and out to the much wider community from which we all come. The structure of the session will be as follows: John Sloboda, Scott Lipscomb and Richard Parncutt will each give a short presentation or ‘position statement’, followed by a period of 15 minutes for responses to those statements. There will then be 20 minutes to consider the draft statement that was circulated earlier, and to take suggestions for any amendments or additions to that statement. Once we have reached a wording with which there is (ideally) a consensus of agreement, we will then consider how such a statement might be effectively used outside the context of this meeting to put pressure on, or offer support to, people in positions of influence and authority; and whether there are other ways in which the community of researchers in the psychology of music might seek to engage with and influence the social and political context within which we work. 9/11 was a watershed for the world. Few events in recent history have so profoundly influenced people everywhere. 9/11 did not change the basic underlying realities of the world. It did, however, radically affect people’s level of awareness, and their motivation to act. It sharpened and polarised. For many of us it was a "wake up call” to the urgency of the need for social change to address the root causes of terrorism and social unrest. These root causes include poverty, global economic and environmental exploitation, and the racism which cements all other injustices in place. If these root causes are not addressed, not only will the war on terror fail, but many millions will die needlessly, and conditions on our fragile earth which support life could be damaged irreparably. "We regard all human beings as intrinsically valuable, rich or poor, weak or strong, and regardless of creed and color. We forget this sometimes, and falter in our applications, particularly outside our borders. The universalization of individual value is still a new idea, after all, in the exceedingly long and bloody history of mankind. But it is an idea so powerful that we can rely on it completely. If this principle guides our actions, we cannot long be wrong. "We do not sacrifice the innocent individual to the stability of the group. The individual matters. This is why we have equality before the law, and the right to have our individual voices heard. It matters to us when someone is mistreated. It matters when the innocent are punished. And it doesn’t matter in some trivial way. The fate of everyone in the world is invisibly but profoundly tied to the fate of everyone else. The Hindus believe in karma, for precisely this reason. No misdeed goes unpunished, however it might appear. Error never vanishes, until it is corrected. And no good deed goes unrewarded." "Let us make every effort to free those who are suffering oppression in Afghanistan. Let us undermine their oppressors with kindness, as much as force. Let us use our military power to deliver food and clothing to the starving and suffering, as much as retribution to the cruel and fanatical. Let us allow our soldiers the opportunity to be genuine heroes, to offer deliverance to the downtrodden, as well as justice to those who wield terror. The attraction of fanaticism and intolerance will therefore be weakened – and weakened more thoroughly than any mere application of force might ensure." The Bush administration acted otherwise, as an elephant enraged by an arrow in its eye. It lashed out, and within weeks was raining bombs on innocent women and children in one of the poorest and most underdeveloped countries on the face of this planet. More innocents died in those bombing raids than in the 9/11 attacks, and Afghanistan remains to this day a ruined and ravaged country, which now exports 75% of the world’s opium, an evil which the Taliban had, for all their other shortcomings, completely eliminated. I am equally proud of another member of the North American academic community, Marc Herold, a Professor of Economics and Womens’ Studies at the University of New Hampshire, who, alone in the world, undertook a comprehensive count of all innocent civilians in Afghanistan killed by US and UK military action, and has maintained an online database with his findings and sources ever since. Since then I have had hundreds, if not thousands, of exchanges with fellow academics all over the world. I would estimate that 95% of these exchanges reinforced in one way or another, a sense of fundamental opposition to the policies emerging from Washington and London, an opposition expressing itself through anger, grief, and even despair. Many colleagues in the USA told me in private that they opposed the Buish agenda, even though they were wary of saying so in public. Academia is, in a real sense, in a position to be the active and creative conscience of the world: not just because academics tend, by and large, to promote liberal and humanitarian ideals: but because we have the privilege of more education than the vast majority of inhabitants of this planet. In the countries overwhelmingly represented at this conference, we have good working conditions, easy access to libraries and other sources of high-quality information, highly developed analytic, verbal, and writing skills, and freedoms in our working patterns that are the envy of other professions. The opportunities for academics to be a force for social progress are immense, and the opportunities (and obligations) get greater with more seniority. Doctoral students and hourly-paid adjuncts may perhaps be excused if the business of paying the rent looms large in their lives. Tenured staff have less excuse, and full professors have no excuse at all. Ironcally, the correlation is often reversed. Some of the most committed workers for social change that I know are students, and low-paid untenured staff. For myself, I realised, within days of 9/11 that my life had to change decisively. I realised that it was not enough to be a good music psychologist. I needed to deploy my skills to helping create a social and political climate in which ending poverty and saving the environment were the prime concerns of all governments and all peoples. There are many ways in which academics can contribute to the creation of a better world, and I am not about to make prescriptions. If you have the will, you will find the way, the time, and the allies. There are people in this room who have already made heroic contributions. My revered compatriot Lech Walensa said the following in a speech earlier this year (March 2004): "We must all work together to reduce human suffering - this is solidarity. The widening gap between rich and the poorest countries is morally inadmissible. This is all the more so since the source of the divide is economic waste. If the poor are abandoned and left to themselves with the feeling of hopelessness, we can expect the foundations of civil life to be threatened." The declaration that some of us may sign, and forward on to our colleagues is not an end in itself. It will only be effective if it is a manifestation of a long-term transformation in the way that we academics see our role in the world, and how we are prepared to engage with the world’s problems. My presentation will include concrete examples of ways in which academics can exercise social responsibility. I will focus on the issue of decision-making on an international level. In a democratic country, power is exercized by elected representatives of the people. In a democratic world, political decisions that have significant international implications are made and shared by countries. The principle of international democracy is described and explored in detail in the Universal Declaration of Democracy adopted by the Inter-Parliamentary Union in Cairo on 16 September 1997. The need for international democracy increases as countries become increasingly interdependent, for example through trade (globalization) and climate (global warming). International democracy is facilitated by technology in areas such as telecommunications and travel, but threatened by concurrent advances in military technology. The principle of international democracy is espoused and realized by the United Nations. Strategies for improving democracy within the UN were developed by the International Roundtable on the United Nations and International Democracy (Geneva, 1-2 July 1994) and by the Second International Conference on a More Democratic United Nations (Vienna, 17-19 September 1991). The principle of international democracy is further realized by the various subsidiary and affiliated organizations of the UN, and by a wide variety of other governmental and independent non-governmental groups. While some groups such as MoveOn and the Center for Democracy and Technology are primarily concerned with democracy and its internet-based implementation, others apply international democratic principles in their endeavors to resolve specific, internationally important issues such as the following. What role should academics play? Academics experience the principle of international democracy in their daily work - for example, through their involvement in the peer-review procedure of leading academic journals. Academics' research, teaching, and administrative skills and their training as open-minded, critical thinkers puts them in a strong position to apply their skills to problems beyond their specialized areas of expertise, and to serve national and international communities by participating actively in the resolution of political problems (e.g., Psychologists for Social Responsibility; Union of Concerned Scientists; cf. Einstein's reaction to Hiroshima). Their training helps them to develop new political initiatives and to assume leadership roles. Since academic training is largely publicly funded, and since politicians tend to lack academic training (there is a limit to what one person can do! ), one may argue that academics have a responsibility to make their skills available for political purposes.